Not far from the Rt. 50 traffic circles in Aldie, Hammerdown is hard to miss. There is plenty of signage and they park a large truck with their logo out front often. The interior if classic BBQ joint with a bar. Ordering is easy, platters or sandwiches with sides. Just as I was about to order a whole brisket came out of the warmer. I ordered the Brisket Sandwich with Mac & Cheese. 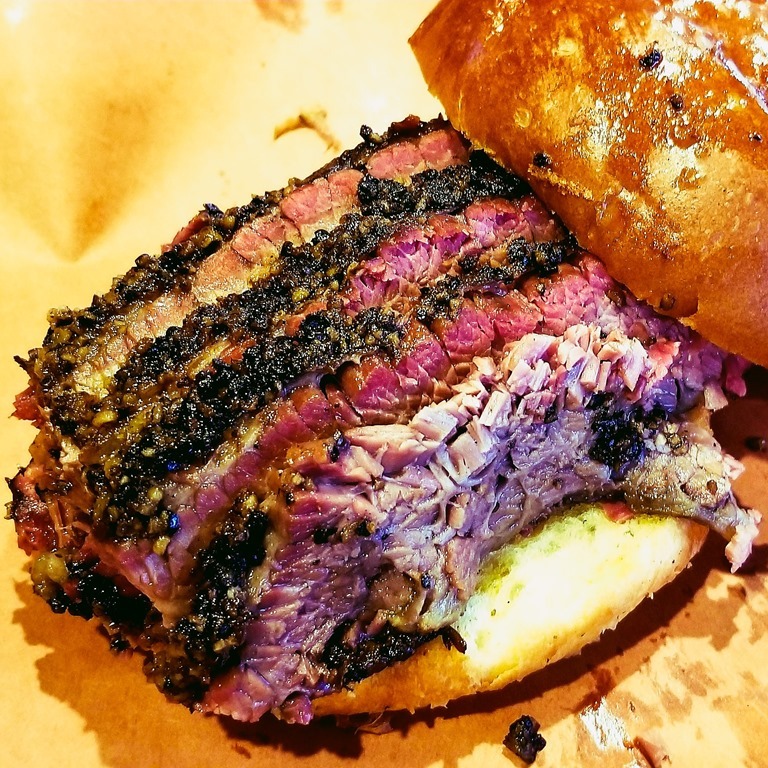 The brisket melts in your mouth, it has a gentle hickory flavor with a perfect thin crispy bark. This is among the best brisket I have had, certainly the best in Virginia. 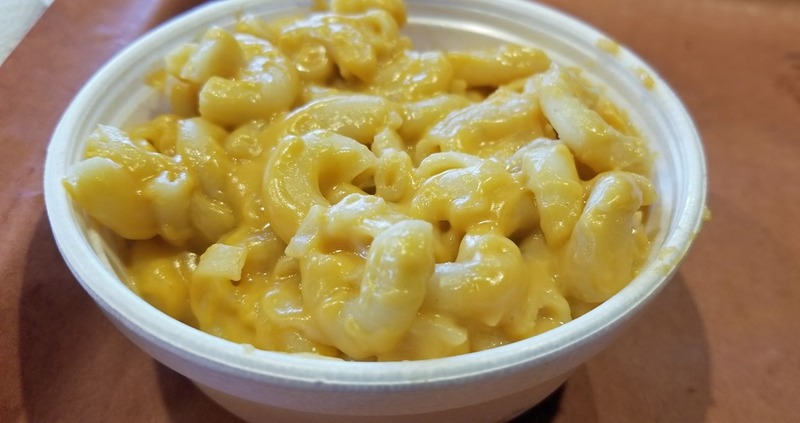 The Mac & Cheese is wonderful and better than any I have had offered at other BBQ restaurants. The ribs are cooked perfectly, juicy, and fall off the bone. 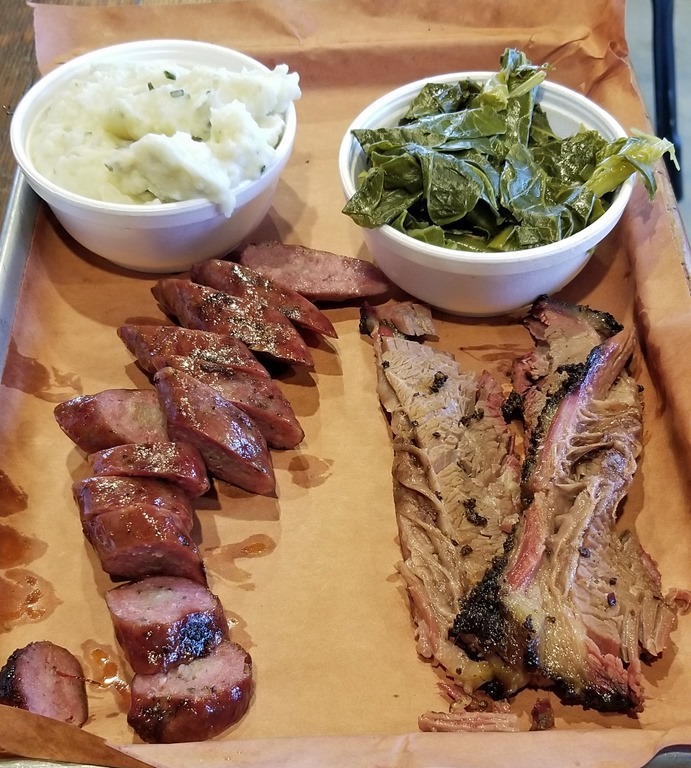 My wife ordered the platter which comes with your choice of 2 meats and 2 sides. 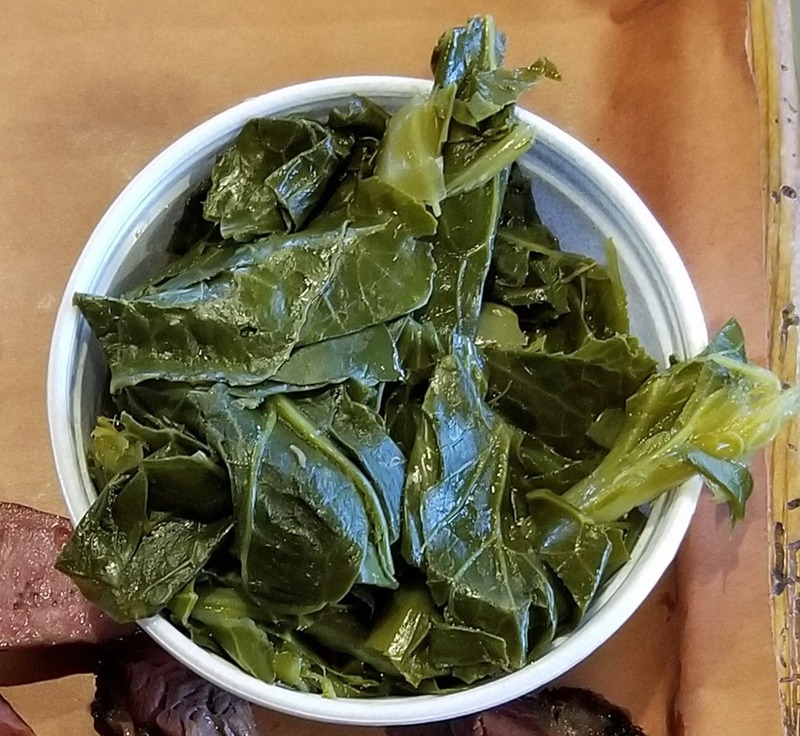 The collards were the best she has had, which coming from this Virginia girl is saying something. 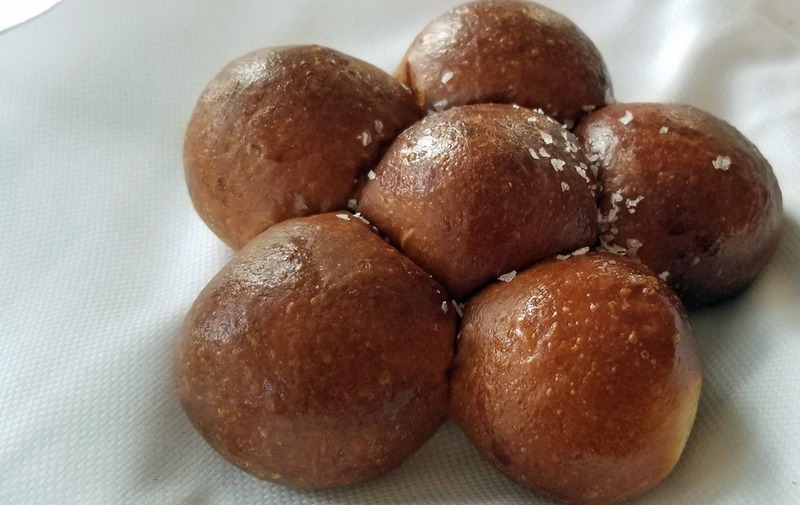 They are cooked in a home-made pork broth that creates a delicious flavor. 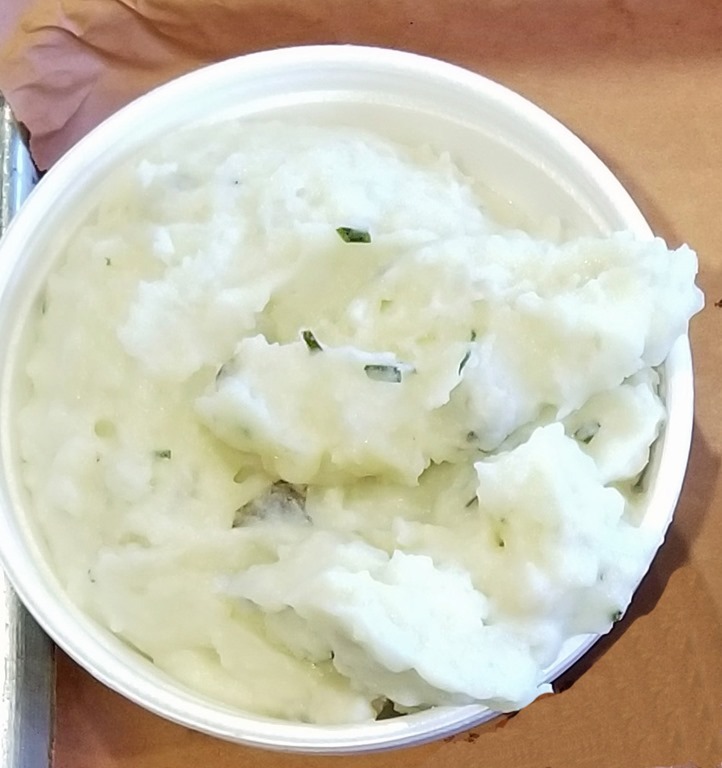 The mashed potatoes with chives were smooth and tasty. 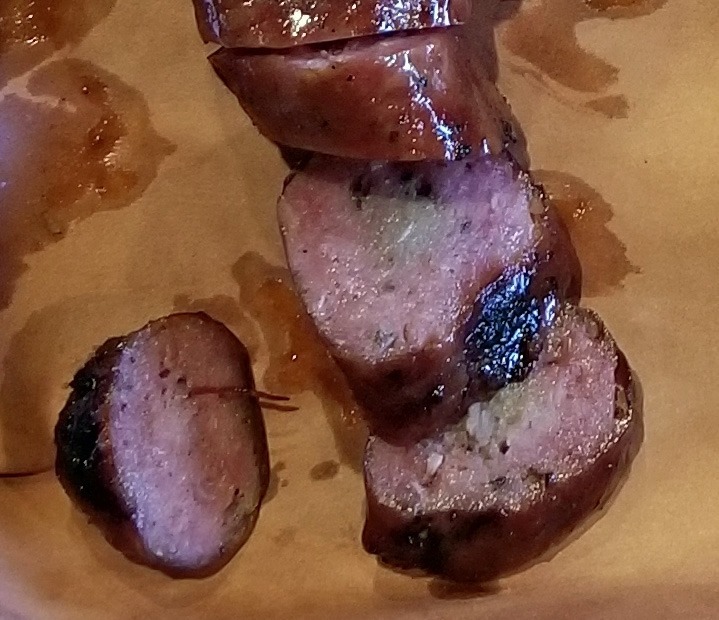 The sausage was smoky and juicy. 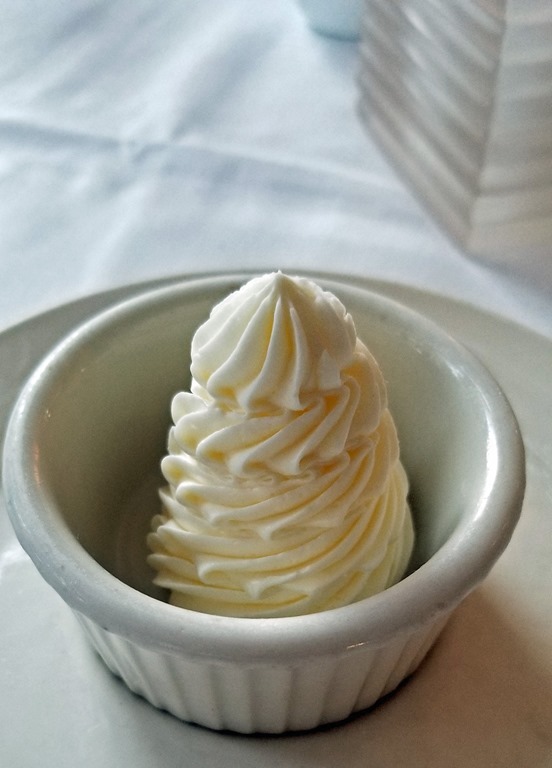 The links are long and you get a good size portion. Sodas and ice tea refills are free. They smoke with a combination of hickory and oak. On the day we visited they were using the smallest of their 3 smokers. During the summer, their peak BBQ season, they can smoke up to 40 briskets and still run out. The smoking starts around 5pm on the previous day, being a Pitmaster is not a 9 to 5 job. The fist class BBQ is awesome but what really got my attention was the sides. Many BBQ joints concentrate on the barbeque and view sides as something they must offer. In the past I have had Mac & Cheese with an order that was obviously Kraft Mac & Cheese or macaroni that had bits of cheese mixed in. It’s wonderful to see high quality well prepared sides offered with exceptional BBQ making for a great dinning experience. While I always measure noise in a restaurant it was not an issue here. At times it was eerily quiet as everyone chowed down on the best BBQ of their life. It is self serve and all the staff behind the counter and bar was open, friendly, and genuinely interested in offering great BBQ. 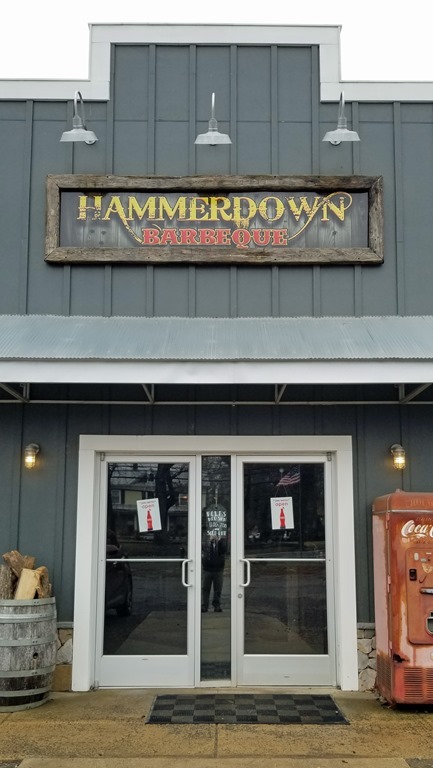 If you live within 100 miles of Aldie, VA and love BBQ you need to make the trip to Hammerdown. For BBQ lovers it’s what they imagine Heaven will be like. Serious Eats says: The olive oil industry is famously rife with fraud. We sent a reporter to California to learn what makes for good oil, bad oil, and everything in between. What is the difference between goat milk and other milk? And which are its nutritional facts? Discover 26 facts and figures about goat milk from Fine Dining Lovers. Eater DC has a list of the local players who made the first cut Beard season has officially arrived: Today the James Beard Foundation released its list of Restaurant and Chef Awards semifinalists for 2019. On Wednesday, March 27, James Beard Award-winning chef Hugo Ortega will announce the (much shorter) list of final nominees at his namesake Mexican restaurant, Hugo’s, in Houston. (For the majority who can’t be present, they’ll also be announced via Twitter and Facebook Live.) Winners will be announced Monday, May 6 at a gala at the Lyric Opera of Chicago. You know you are in for a treat when dining in a beautifully restored Victorian home. We arrived a early and waited for our table in the comfortable bar. The dining rooms are elegant and spacious. Attention to detail is everywhere. Homemade bread came out first and disappeared quickly. 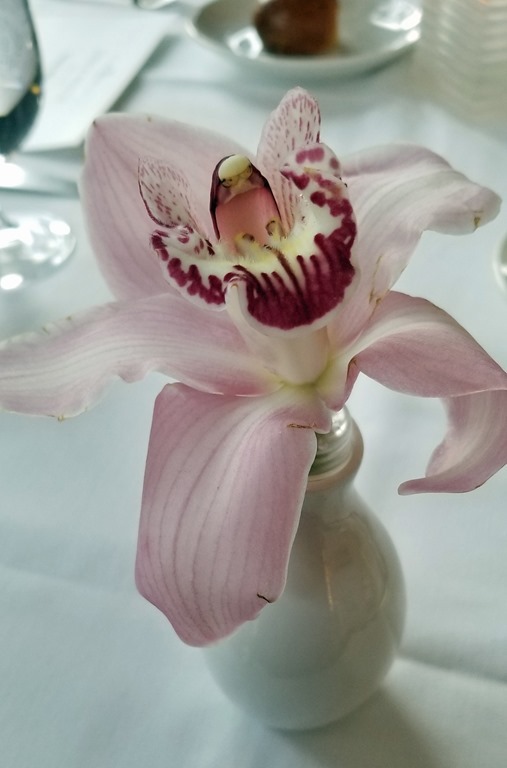 We joined friends for dinner the weekend after Valentine’s Day and were treated to a special holiday fixed-price menu created by Executive Chef Tom French. My wife started with these wonderful Fried Oysters with Avocado, Cilantro, Lime, Brussel Slaw, and a Tomato Concasse. This Lobster Bisque was amazing. It was full bodied and super smooth. With each sip I pictured a Sous Chef pushing it through a chinois 20 times. 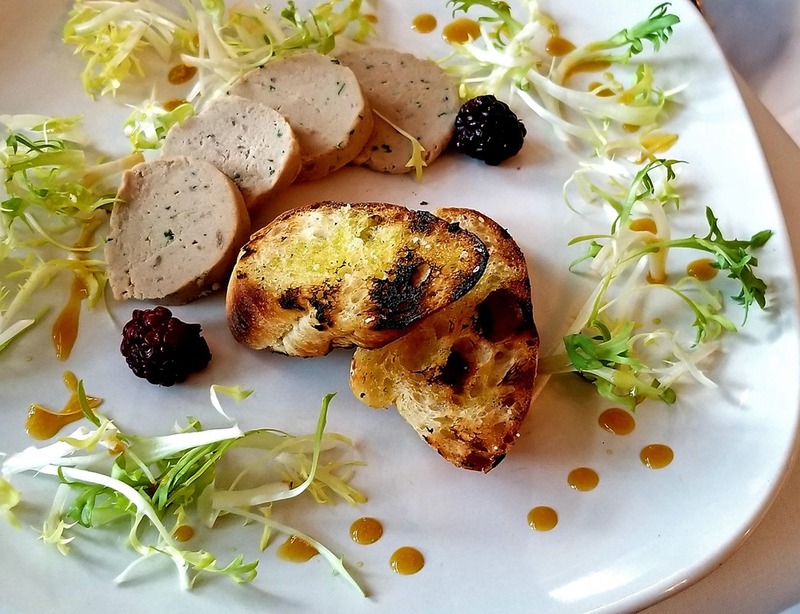 Duck & Foie Gras Rillettes with Pickled Blackberry, Orange Gastrique, and Frisee. 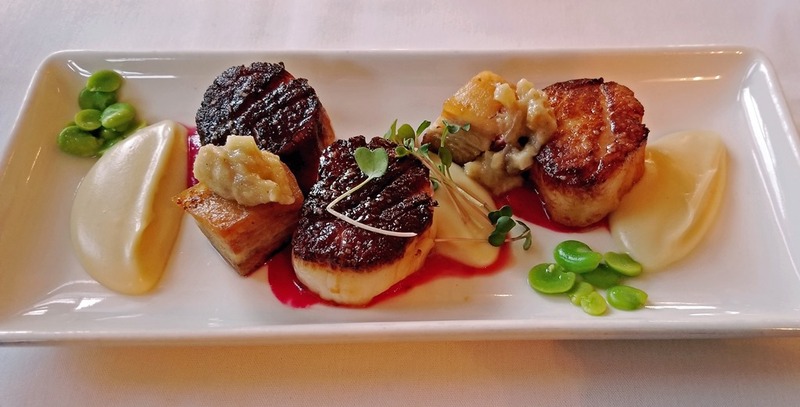 For my entrée I chose the Sea Scallops with Braised Pork Belly, Vanilla Parsnip Puree, Apple Fennel Chutney, and a Beet Vinaigrette. The charred scallops were cooked perfectly, not an easy feat. Often they are over cooked trying to get them blackened, these were not. The pork belly, well it’s bacon, enough said. The vanilla parsnip puree was luscious and smooth like the bisque. 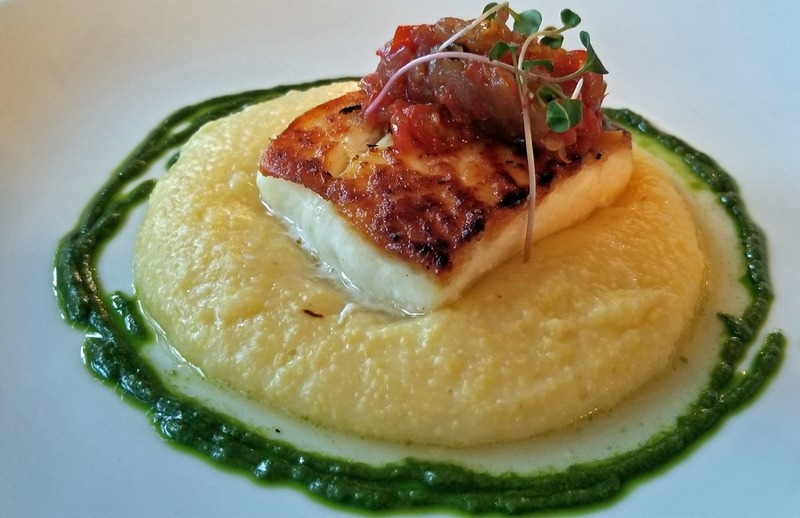 My wife went with the Halibut on a bed of Creamy Polenta, Sweet & Sour Peppers, and ringed with a Basil Pesto. The halibut was divine. It had a nice sear and paired well with the creamy polenta. If you favor fish this is the dish for you. While the food is first class, we eat with our eyes and the plating is exceptional. 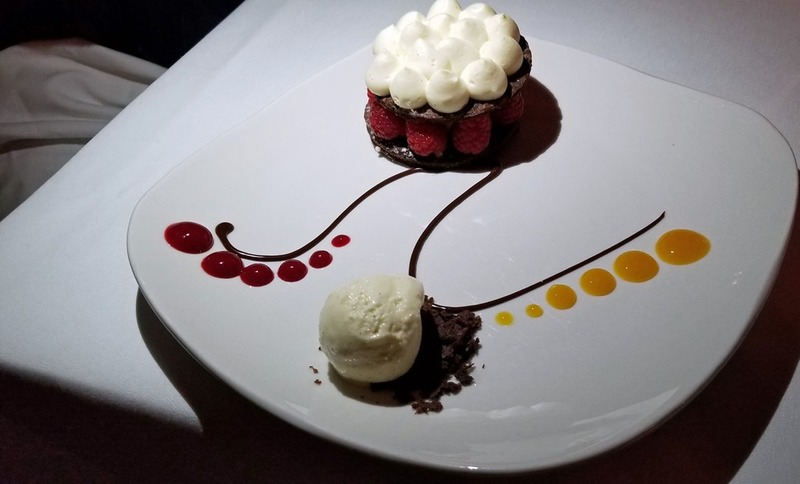 This Chocolate & Raspberry Mille Feuille was the perfect blend of chocolate with a hint of raspberry. 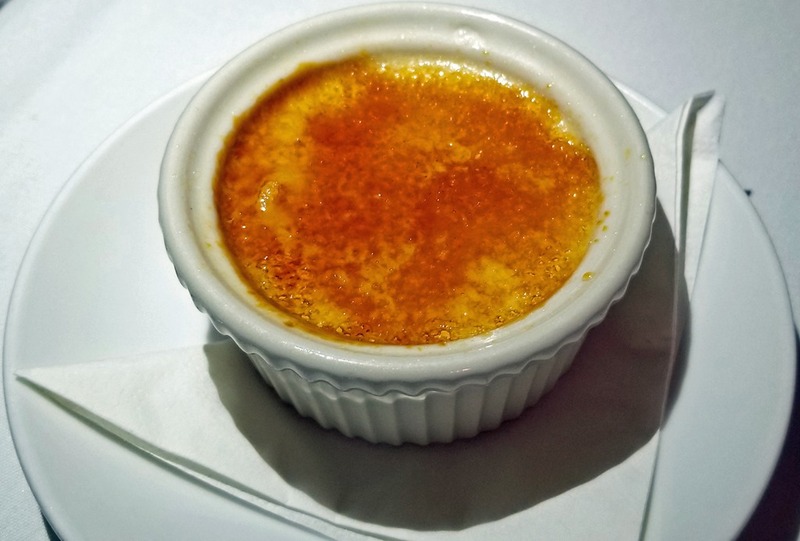 The Crème Brûlée was rich and creamy with a nice caramelized top, one of the best I have had. The service was first class, always attentive and ahead of our needs. Noise volume was not an issue, it’s an older home with a décor that doesn’t lend itself to bouncing sound like a spy satellite. Joshua Wilton House is at the pinnacle of fine dining in Harrisonburg. It may be perceived by some as a special occasion destination, and it is, but every time you visit and enjoy the food it will be a special occasion. 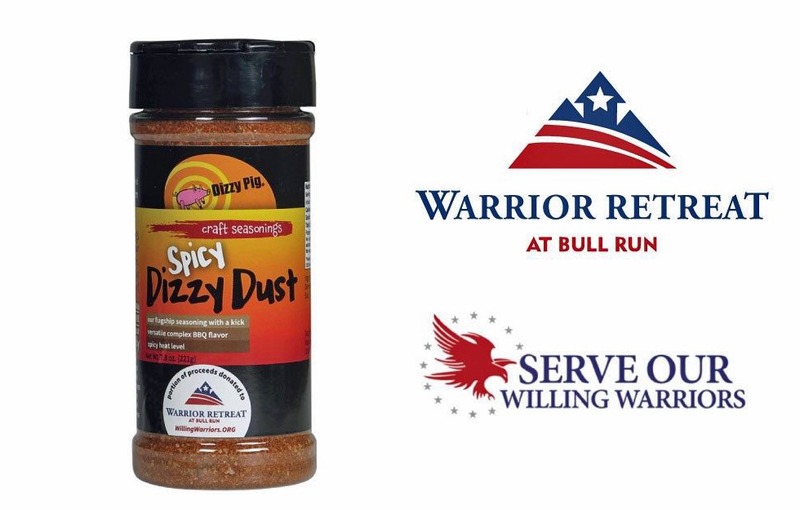 Manassas, VA based Dizzy Pig BBQ Company has created a spicy version of their top selling Dizzy Dust seasoning. Owner Chris Capell says a portion of the proceeds from the new Spicy Dizzy Dust will be donated as way for the company to give back to the community through local charities. We are thrilled the Dizzy Pig team chose the Visiting Chef Program at the Warrior Retreat at Bull Run to be their first charity. If you like to spice up your food, then you will love Spicy Dizzy Dust. It works on everything you put regular Dizzy Dust on. I have used it on chicken and pork schnitzel to add heat for a great taste. The schnitzel is a lightly breaded pork cutlet. To get Spicy Dizzy Dust on the cutlet you need to add it to the panko just before you coat each side of the cutlet. Mixing it directly into the panko doesn’t work well because it is heavier than the panko and settles to the bottom. Like any spicy seasoning you will need to experiment on different foods and with varying amounts to find your spice tolerance sweet spot. 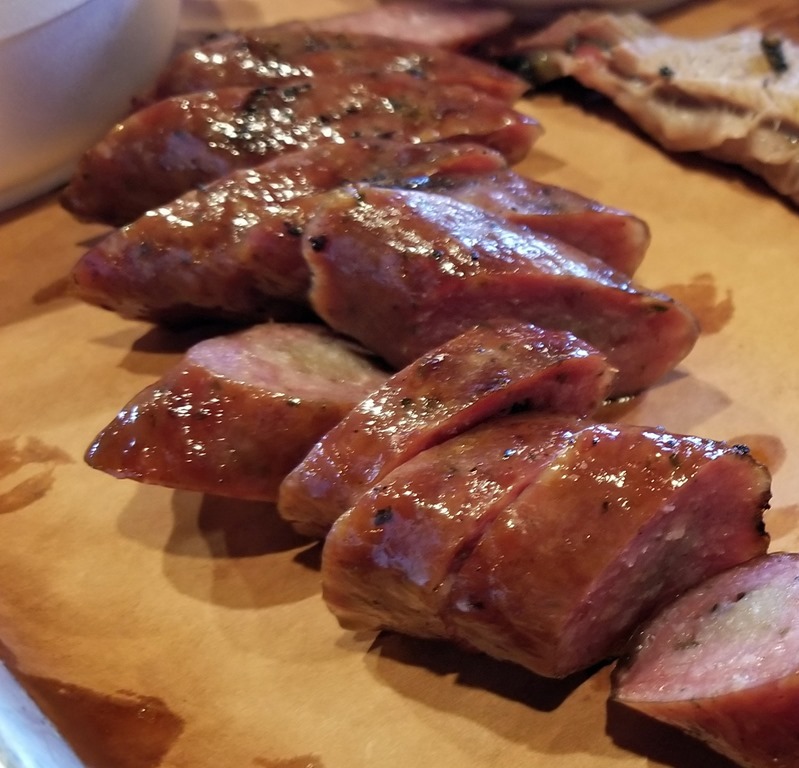 Dizzy Pig has some great spicy recipes on their web page. You can purchase Spicy Dizzy Dust online or at one of many retail locations selling the line of Dizzy Pig BBQ spices. Try it, you won’t be disappointed and will be supporting the Warrior Retreat at Bull Run.